Vista, CA, October 04, 2018 — MedicalFieldCareers.com, a free online resource for students training for careers in healthcare, has revealed its official 2018-19 list of the Top 30 Affordable Medical Assistant Programs. 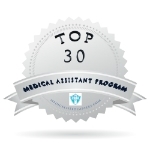 The MedicalFieldCareers.com Top 30 Affordable Medical Assistant Programs list appears below. To read more about the schools featured on this list, the methodology used to create it, and what to look for when comparing other programs against these, please visit the Top 30 Affordable Medical Assistant Programs list on MedicalFieldCareers.com.